The China Falcons, as the Photo Recon squadron of the Fourteenth Air Force was called, were so named because of the sharp eyes of the cameras they used. Their main weapon, the camera, could reach out and see and record accurately the many small details so vital to the strategic planning of the sordid business of war on Japan. Photographing and mapping were the keynotes to practically all the missions flown by the bombers and fighters. Prior to the activities of the Photo Reconnaissance Squadron of the Flying Tigers, the charts were so bad that many a flight was not completed. 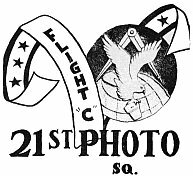 The 21st Photo Reconnaissance Squadron was originated in Colorado Springs in 1942 and after extensive training flew to China in June, 1943. By October, 1944, replacements were needed to relieve some of the personnel, one of whom was Corporal George W. Jenkins of Tipp City, Ohio. He was an aircraft mechanic, specially trained and necessary to "keep 'em flying." George tells of his activities with the 21st Photo Recon. "I arrived in Bombay, India, in October 1944 with six thousand other replacements for the Asiatic Theater. On the way over there was a scare or two when scuttlebut had it that we were about to be torpedoed by enemy subs but the convoy destroyers must have kept them at a distance because they didn't bother us. The reports did shake us up some. The U.S.S. Wm. Mitchell had a lot of life boats but not nearly enough for all the troops on board. After landing in Bombay, we sat on our barracks bags from 1500 hours to midnight then entrained to Asvali about three miles from Camp Beal. The very first night at Camp Beal I drew guard duty and that was an experience. "Army guard is twenty-four hours with four hours on and eight off but alerted. I went to post at 1800 hours. I was to patrol the area around two brick buildings. One housed ammunition and the other gasoline. The grass around these buildings was about up to my waist and knowing that India is famous for many deadly snakes, I cut a four foot piece of bamboo to supplement my rifle with the one bullet. Needless say I am deathly afraid of snakes. "Fully equipped as a good soldier should be with canteen, first aid kit, ammo pouches with no shells, and raincoat rolled and fastened to the back of my web belt, I started out carrying the rifle in one hand and the bamboo in the other. I spread the tall grass as I advanced slowly the first round thinking I would make a path and wouldn't have to be so careful on the other rounds. Then, too, I thought that this method would chase any snakes from my path back into the weeds. "At about 1700 I had relaxed a little from watching for snakes and the moon was covered with clouds. All of a sudden something hit me on the back of the leg and I knew it was a snake. I didn't feel any pain but I had heard that you don't feel anything because of the numbness. I imagined my leg was growing numb but I took off on a dead run trying to get away from that awful thing. It kept bumping my legs at every step and I struck at it with the bamboo like I was whipping a horse I was riding. I must beat that snake off, I thought, before it gets a better hold because right now his teeth are fastened in my pants leg. About the time I got out of the tall grass, the moon came from behind the clouds and I glanced around at my "snake" only to find that my raincoat had come unrolled and was flapping around my legs as I ran. At that time I came face to face with one of the officers and after saluting tried to explain what had happened. He confessed that he would have done the same thing and ordered me back to my post. I remained alert the rest of my tour. "From Camp Beal the few that were destined for China proceeded to Calcutta by train, a short stop there, then on through a couple of other cities, then to Chabua. We flew the Hump into Kun-ming. China, the headquarters of the 21st Photo Recon Squadron. Once there work began in earnest. Many of the P-38s needed the special training of the new mechanics. It wasn't long until the grounded planes were in the air again carrying on their missions." One mission which was successful as far as the photographing was concerned turned out to be all but disastrous. It happened this way: Lieutenant William H. Brewer of Flint, Michigan, flew his P-38 on his assigned mission. His plane had the full supply of fuel with the reserve to enable him to return safely but on the way back he became lost, used up his fuel and elected to land on the top of a mountain rather than bail out. 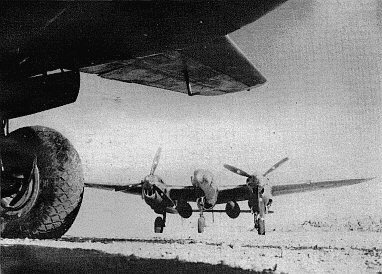 The landing area was only 1,600 feet long as it was later measured, much too short for a P-38. He made it safely and walked out. This was close to Yenan, China, the capital of Communist China. About three weeks later he walked into the base with the report that the plane could be flown out and the pictures recovered. Another pilot flew a C-47 with five barrels of gas, a mechanic, and a P-38 pilot equipped with parachutes to try to rescue the downed photo plane. After evaluating the situation and photographing the locale, they returned to base deciding it was too great a risk. Later another C-47 took the mission and landed. The mechanic found that the dryness of the air and the high altitude had dried out the diaphrams in the carburetors and the engines could not run. There was nothing else to do but to use the plane for spare parts. photo recon squadron of the Fourteenth Air Force. Several L-5s, liaison planes, which probably came from the Burma operation, were pressed into service to retrieve the needed parts. George W. Jenkins made one trip with a pilot on September 12, 1945. He said they circled the landing area to determine how best to land. The pilot side-slipped the L-5 and landed in about seven hundred feet. He and the pilot spent the whole day there enjoying the coolness of the mountain top and removing parts to build up the inventory of spare parts so needed to repair the other planes. Many trips were made to the mountain top in the L-5s. 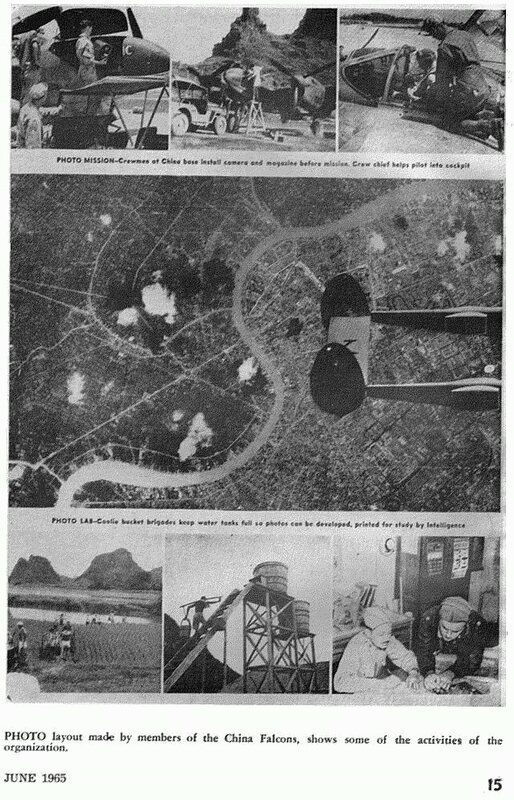 The Japanese were really annoyed by the activities of the four squadrons of Photo Recon groups and bombed the bases many times. Outside of damage to the runways, there was little damage to the planes as they were secure in revetments. The type bombs dropped were what we called daisy cutters. They were dropped in clusters and a detonator scattered them at a certain altitude. They were made of a piece of bamboo maybe a foot long, shrapnel like in a grenade and an arming fan that spun off on the way down. They exploded on impact and covered a large area. The song of the Daisy Cutters was a song of death should anyone be hit. One such contrivance sang into the repair shop and cut a three-eighths inch chain in two places off a chain hoist used to change engines as slick as one could slice a banana.